Nifty opened negative on settlement day, and stayed in a range of 20 points for the better part of the session, but huge short covering in the dying minutes saw the index cross 6300 for the first time after 3 years but closed just below it at 6299.15, a huge gain of 47.45 points. The broader market was positive, with 737 advances to 600 declines. 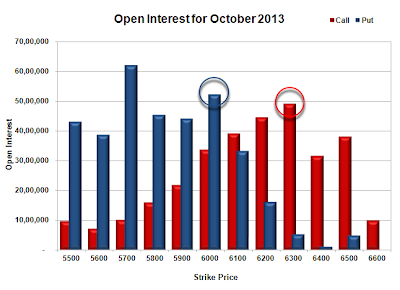 OI table at the start of the series is building up support around 6000 level. Call option 5600-6700 added 44.32 lacs huge amount of OI. Put option 6600-5600 added 50.31 lacs huge amount of OI. 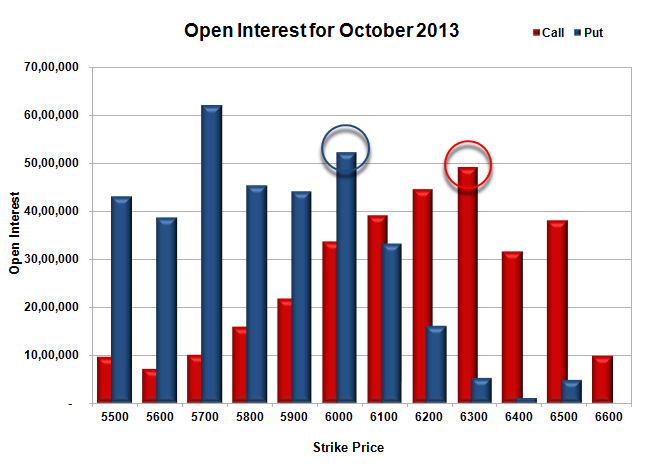 Nifty Open Interest is at 2,30,29,900 up by 41,77,600, with increase in price, most probably huge long build-up. 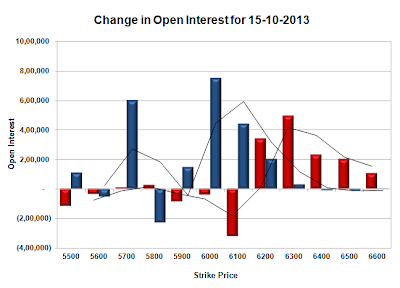 Bank Nifty Open Interest is at 17,35,950 up by 4,92,725, with increase in price, most probably huge long build-up. FII’s bought huge 7.71 lacs Futures, mostly short covering, as their net OI decreased by 167031 contracts (includes 239956 longs and 224538 shorts) and the average price per contract comes to around 6269.94. 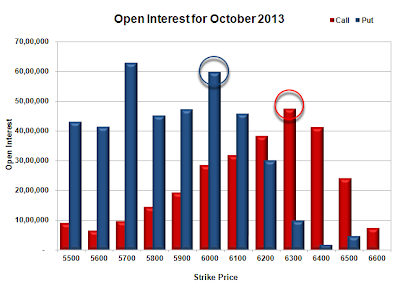 FII’s future open contract as on date is 502227. PCR Open Interest (Volume) at start of series is just at 1.187. 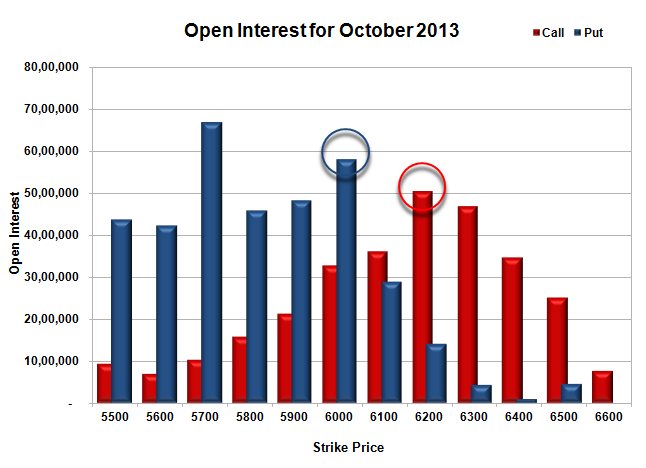 Initial Support right now at 6200, with huge OI of 28.89 lacs, below that at 6100, with OI of 27.76 lacs. Best Resistance at 6300, with OI of 27.56 lacs and above that at 6400, with OI of 25.47 lacs. 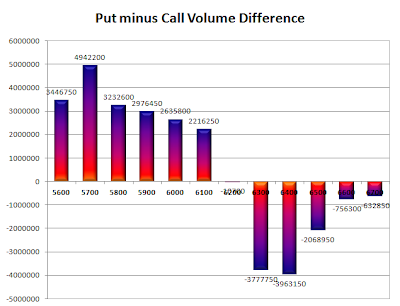 Day Range as per Option Table is 6224 - 6347 and as per VIX is 6239 - 6360 with 6281 as the Pivot. 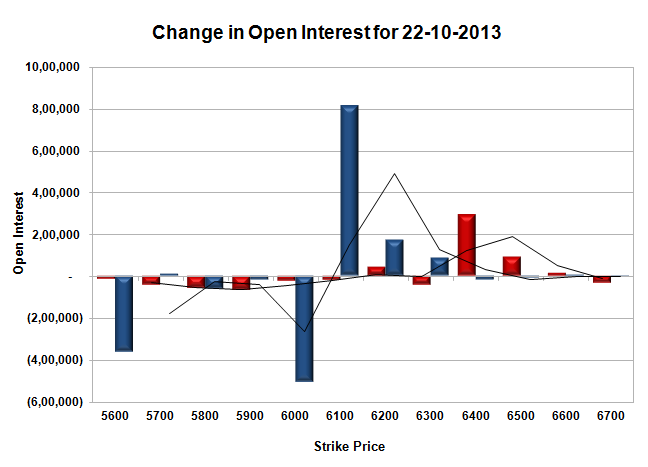 Nifty opened positive, but saw the sellers dominating from the morning itself. The index was unable to sustain the highs and closed at the lows of the day at at 6101.10, a huge loss of 43.80 points. The broader market was also weak, with 494 advances to 854 declines. As per OI table range till expiry comes around 6050-6240. 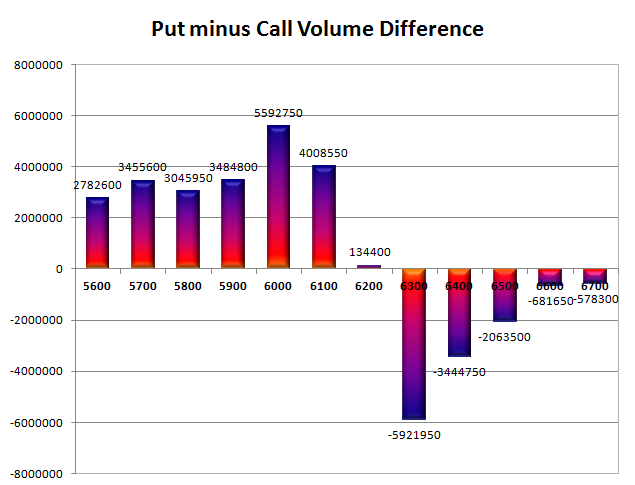 Call option 6100-6300 added 11.99 lacs huge amount of OI with profit booking seen at 6400 and above strike prices. 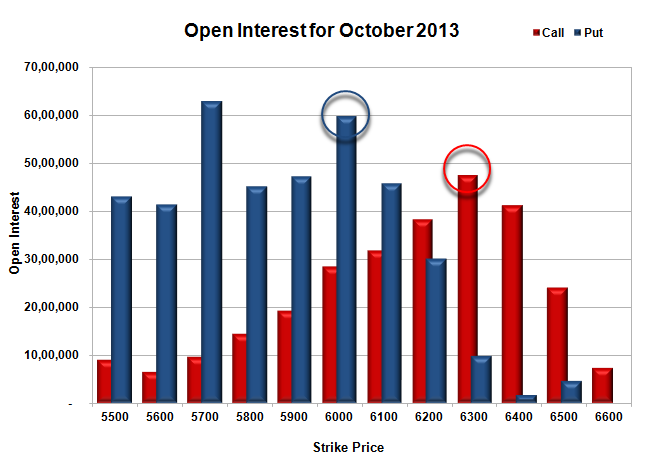 Put option 6000 added 3.66 lacs huge amount of OI with short covering seen at 6100 and above strike prices. Nifty Open Interest is at 1,41,28,200 down by 19,92,800, whereas Nov Series added 29.80 lacs OI, with decrease in price, most probably 100% roll-over with huge short build-up. Bank Nifty Open Interest is at 15,57,300 down by 2,78,825, whereas Nov Series also added 1.73 lacs with decrease in price, most probably rollover with huge long liquidation. FII’s bought small 1.72 lacs Futures, mostly long build-up, as their net OI increased by 8126 contracts (includes 126201 longs and 122767 shorts) and the average price per contract comes to around 6043.41. 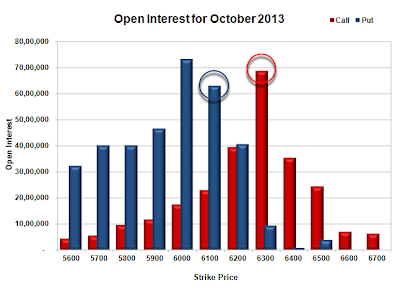 FII’s future open contract as on date is 545920. 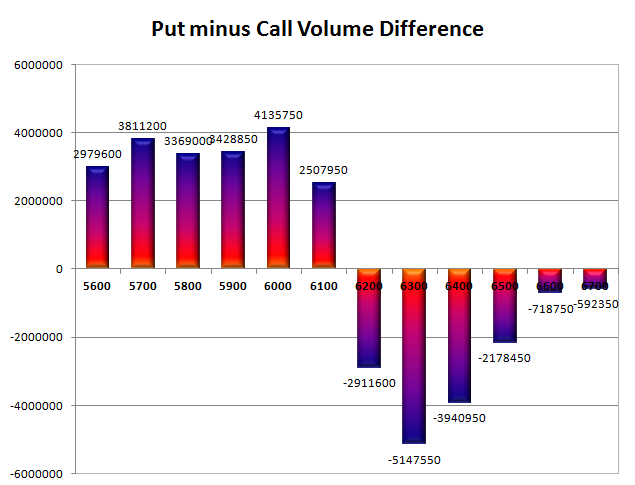 PCR Open Interest (Volume) is down to 1.402. 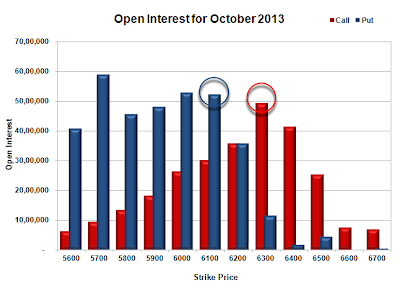 Initial and best support now 6000, with highest OI of 65.96 lacs, below that at 5900, with huge OI of 48.46 lacs. 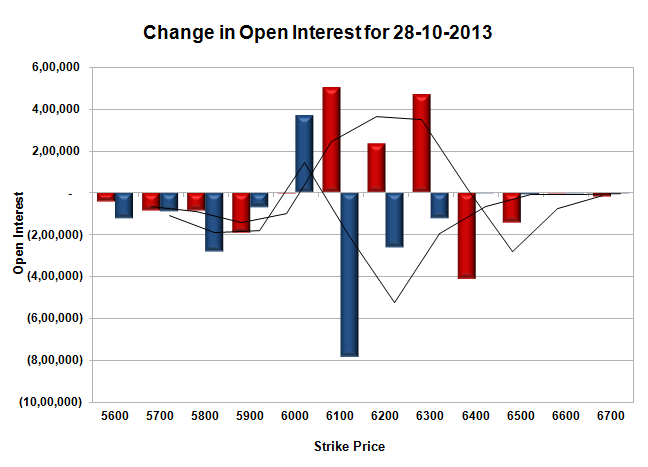 Resistance getting better at 6200, with OI now above 57.26 lacs, above that at 6300 with huge OI of 64.28 lacs. 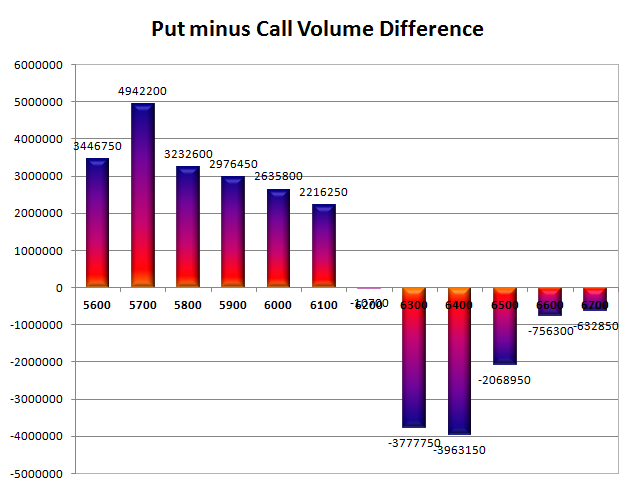 Day Range as per Option Table is 6055 - 6176 and as per VIX is 6033 - 6169 with 6121 as the Pivot. 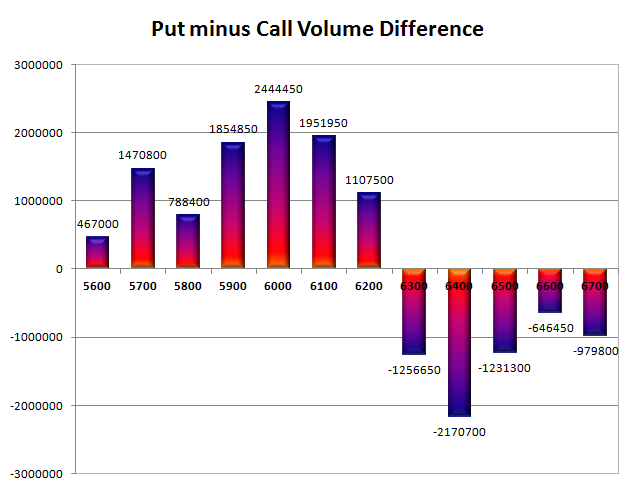 Nifty opened weak and stayed weak for the most part of the day in a small range with all up-moves being sold off. The index ultimately closed near the lows of the day at 6144.90, a loss of 19.45 points. On a week-on week basis the index lost 44.45 points or approx 0.72%. The broader market was very weak, with 492 advances to 863 declines. 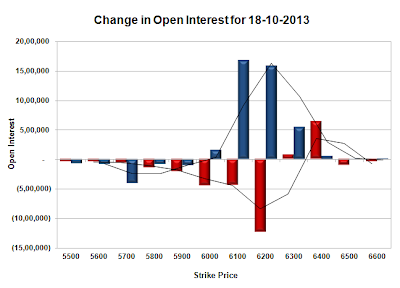 As per OI table range till expiry comes around 6050-6250. 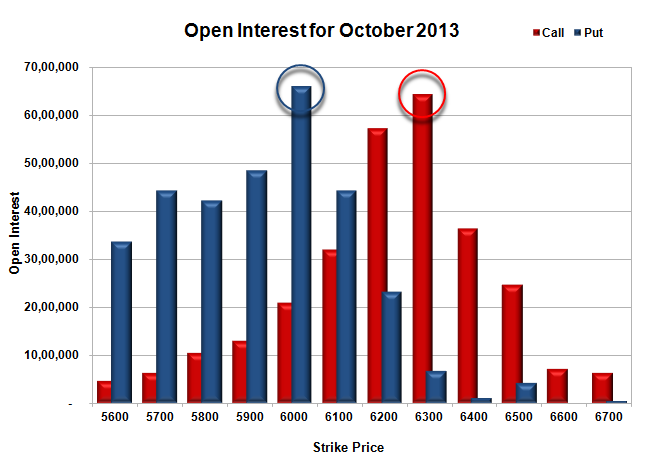 Call option 6100-6200 added 9.52 lacs huge amount of OI with profit booking seen at 6500 and above strike prices. Put option 6100-5900 added 7.65 lacs huge amount of OI with short covering seen at 6200 and above strike prices. 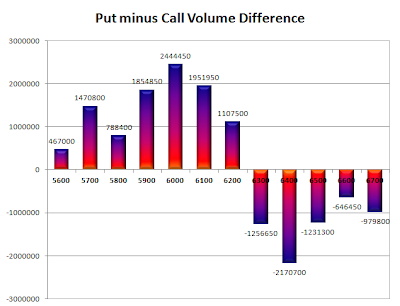 Nifty Open Interest is at 1,61,21,000 down by 11,14,350, whereas Nov Series added 17.03 lacs OI, with small decrease in price, most probably 100% roll-over with huge short build-up. 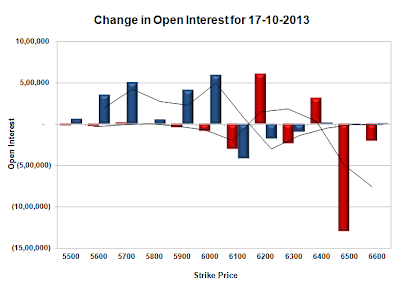 Bank Nifty Open Interest is at 18,36,125 up by 8,225, whereas Nov Series also added 11.7 thousand with small decrease in price, most probably short build-up. FII’s sold 4.25 lacs Futures, mostly short build-up, as their net OI increased by 10045 contracts (includes 74580 longs and 83089 shorts) and the average price per contract comes to around 6082.83. FII’s future open contract as on date is 537794. 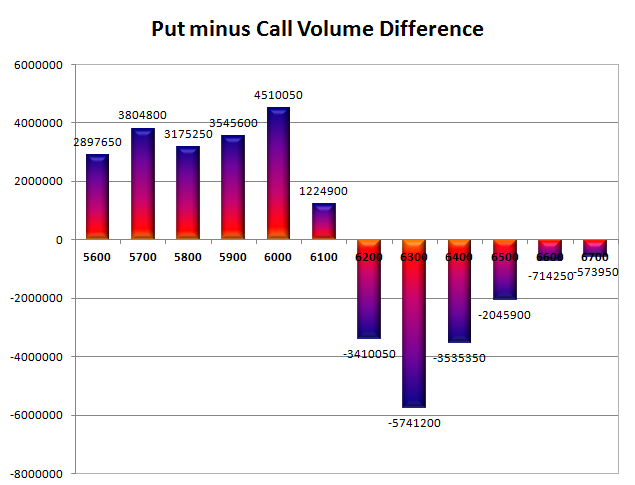 PCR Open Interest (Volume) is falling fast and at 1.446. Initial support still at very much 6100, with OI of 52.13 lacs, below that at 6000, with huge OI of 62.30 lacs. 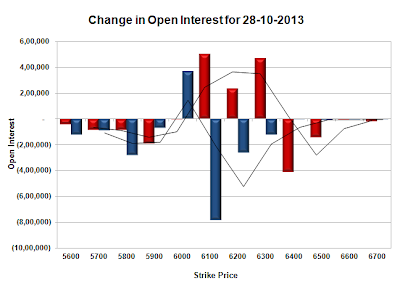 Resistance got better at 6200, with OI now above 54.93 lacs, above that at 6300 with huge OI of 59.60 lacs. Day Range as per Option Table is 6086 - 6209 and as per VIX is 6079 - 6211 with 6149 as the Pivot. Nifty opened weak but saw the buyer take control and within the first hour of trade the index went on to touch the highs of the day around 6252 level. The Seller who are sitting pretty at higher levels got busy to move the index to lower end at 6142 but closed just above at 6164.35, a small loss of 14.00 points. The broader market was weak, with 591 advances to 756 declines. 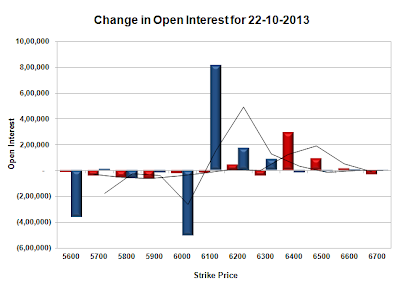 As per OI table 6300CE level now has the highest OI of 60 lacs. 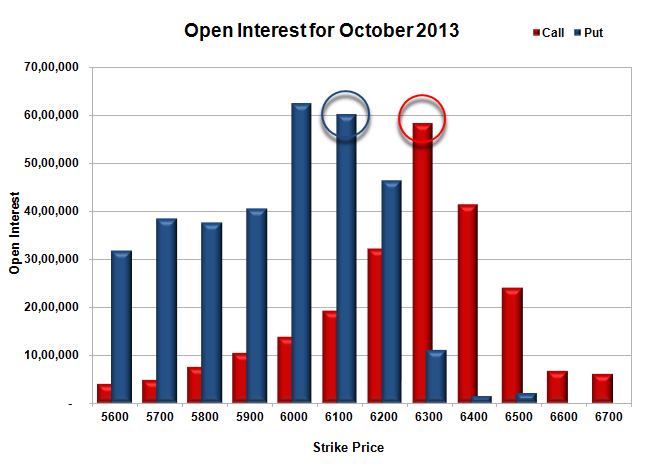 Call option 6200-6500 added 10.01 lacs huge amount of OI with short covering seen at 6100 and below strike prices. 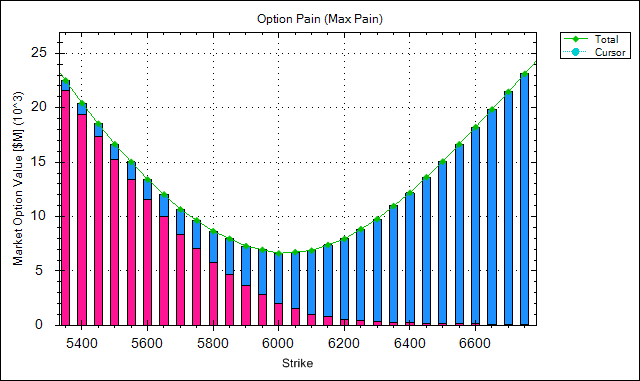 Put option 6300, 6000 added 2.23 lacs huge amount of OI with short covering seen at 6100-6200 strike prices. Nifty Open Interest is at 1,72,35,350 down by 3,47,800, whereas Nov Series added 9.20 lacs OI, with small decrease in price, most probably roll-over with huge short build-up. 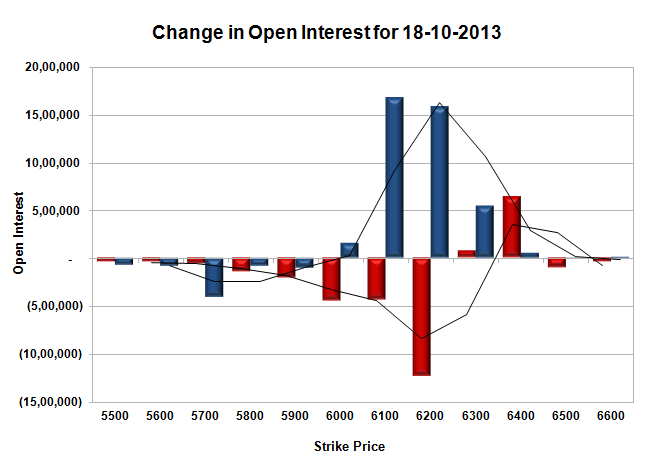 Bank Nifty Open Interest is at 18,27,900 down by 30,600, whereas Nov Series added 60.9 thousand with small increase in price, most probably roll-over with long build-up. FII’s sold 1.15 lacs Futures, mostly short build-up, as their net OI increased by 13936 contracts (includes 97830 longs and 100132 shorts) and the average price per contract comes to around 6097.52. FII’s future open contract as on date is 527749. PCR Open Interest (Volume) has dipped below 1.5 and now at 1.498. Initial support still at 6100, though covered a few more but OI still above 50.72 lacs, below that at 6000, with huge OI of 57.45 lacs. Initial Resistance still at 6200, with OI of 45.79 lacs, above that at 6300 with highest OI of 60.03 lacs. 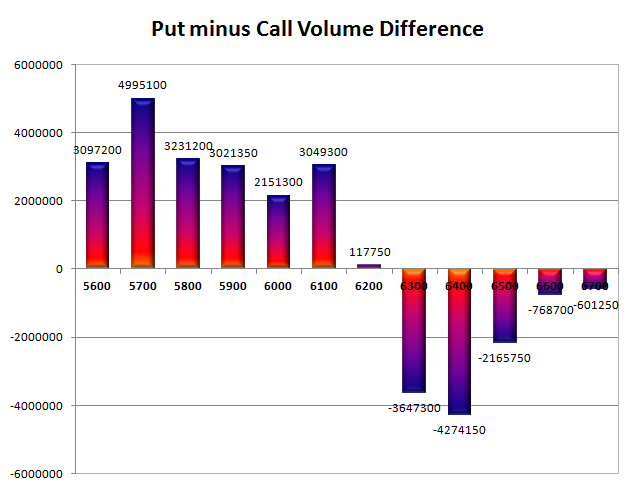 Day Range as per Option Table is 6116 - 6247 and as per VIX is 6098 - 6231 with 6187 as the Pivot. 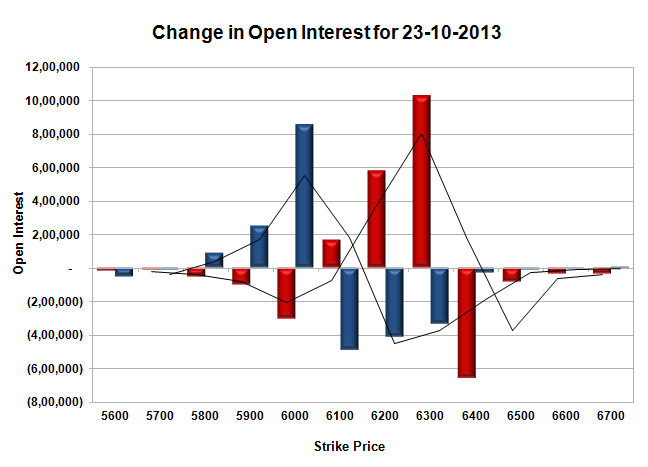 Nifty opened just weak and stayed in a narrow range of 38 points keeping previous days close as the pivot. The index ultimately closed flat at 6202.80, a very small loss of 2.15 points. The broader market though was strong, with 894 advances to 492 declines. 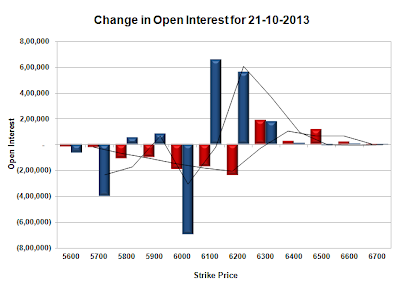 As per OI table 6100 level is the support till expiry. Call option 6400-6500 added 3.81 lacs huge amount of OI with short covering seen at 6100 and below strike prices. 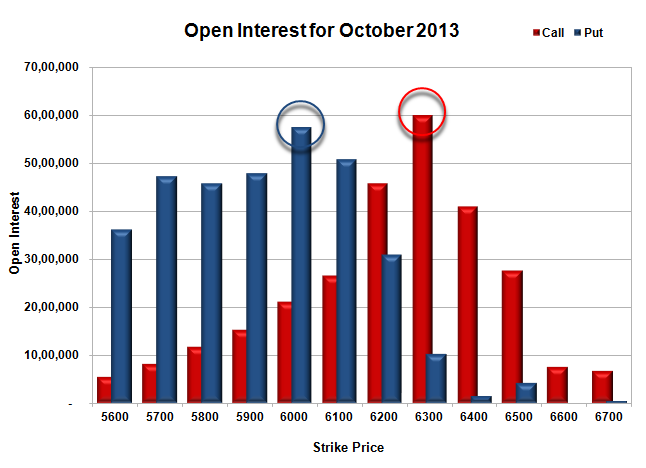 Put option 6300-6100 added 10.75 lacs huge amount of OI with profit booking seen at 6000 and below strike prices. 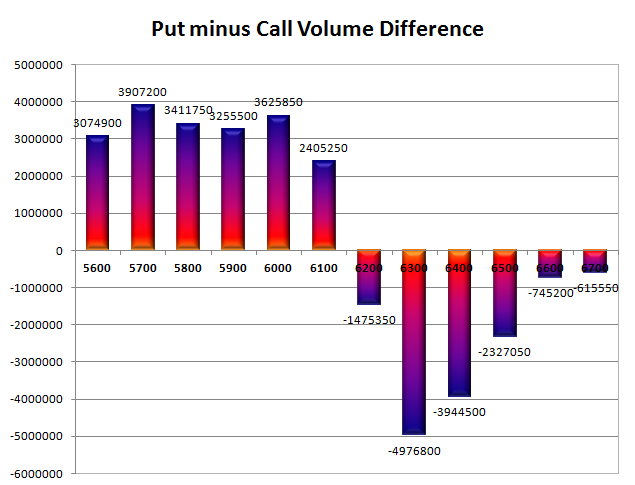 Nifty Open Interest is at 1,82,86,300 down by 2,17,250, whereas Nov Series added 6.23 lacs OI, with no change in price, most probably 100% roll-over with huge long build-up in next series. Bank Nifty Open Interest is at 18,42,700 up by 34,150, whereas Nov Series added 23.6 thousand with increase in price, most probably huge long build-up in both series. FII’s bought 1.51 lacs Futures, mostly long build-up, as their net OI increased by 14306 contracts (includes 59465 longs and 56439 shorts) and the average price per contract comes to around 6127.74. FII’s future open contract as on date is 500802. 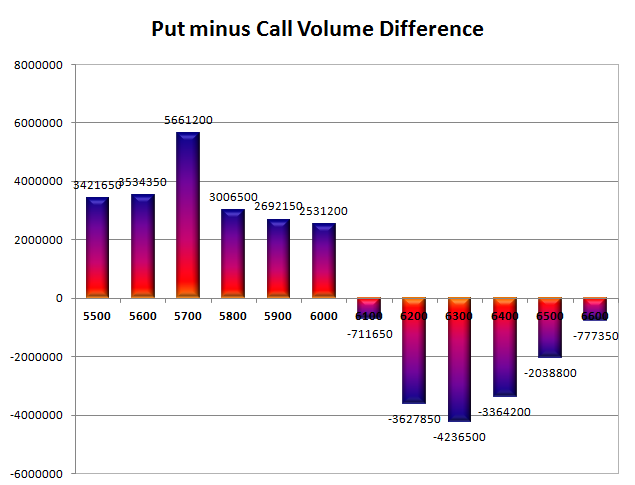 PCR Open Interest (Volume) has gone down a bit to 1.573, due to huge profit booking at 6000 and below PE level. 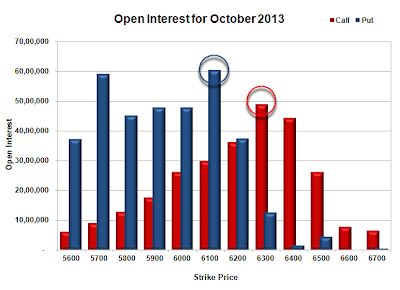 Initial support got better at 6100, with highest OI of 60.48 lacs, below that at 6000, with huge OI of 47.78 lacs. 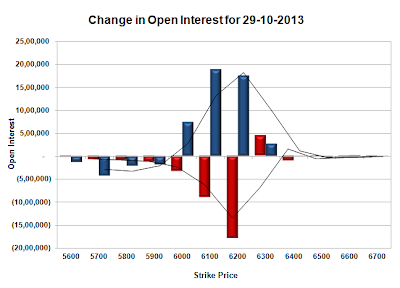 Best Resistance still at 6300, with OI of 48.99 lacs, above that at 6400 with OI of 44.40 lacs. 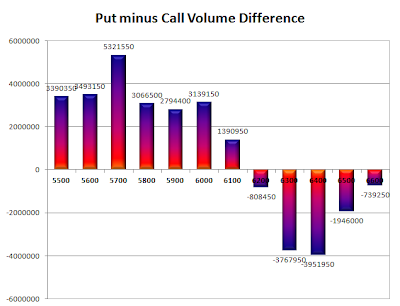 Day Range as per Option Table is 6139 - 6265 and as per VIX is 6138 - 6268 with 6202 as the Pivot. Nifty opened positive on the back of good global cues and did not look back to scale resistance after resistance with each passing hour. The index scaled 6200 level after 5 months but closed just lower at 6189.35, a gigantic gain of 143.50 points. The broader market was strong, with 806 advances to 542 declines. 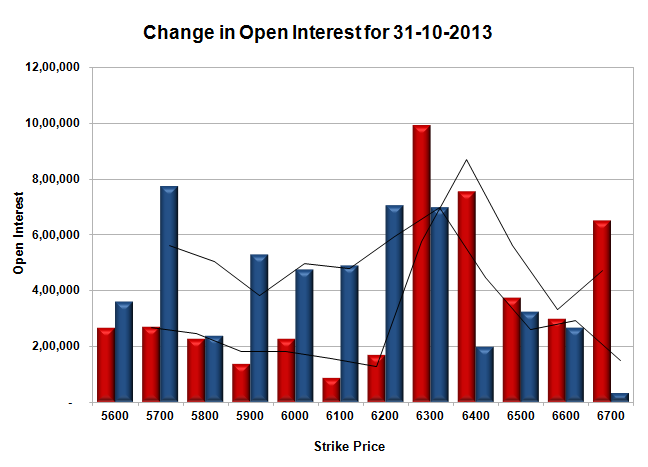 As per OI table base has been established at 6000 level. Call option 6300-6400 added 7.17 lacs huge amount of OI with short covering seen at 6200 and below strike prices. 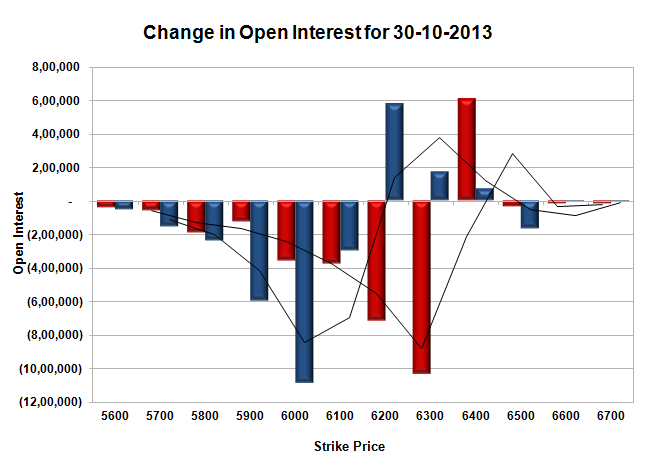 Put option 6300-6000 added 39.63 lacs huge amount of OI with profit booking seen at 5900 and below strike prices. Nifty Open Interest is at 1,88,14,800 down by 4,17,300, with increase in price, most probably huge short covering. 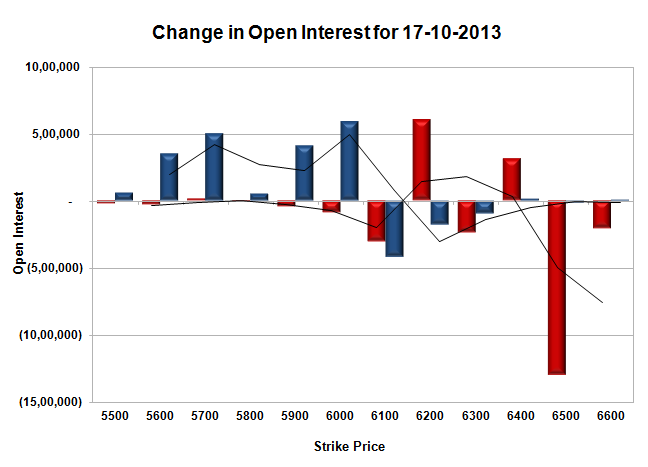 Bank Nifty Open Interest is at 18,79,300 up by 78,475, with increase in price, most probably huge long build-up. 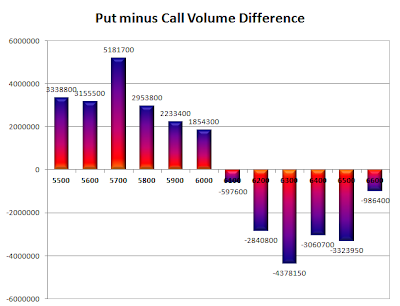 FII’s bought huge 11.28 lacs Futures, mostly short covering, as their net OI decreased by 24885 contracts (includes 109205 longs and 86642 shorts) and the average price per contract comes to around 6106.76. FII’s future open contract as on date is 479717. 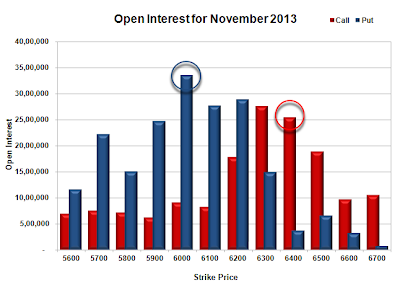 PCR Open Interest (Volume) is at 1.561, the highest of the series. Initial support now placed at 6100, with OI above 45.76 lacs, below that at 6000, with huge OI of 59.79 lacs. 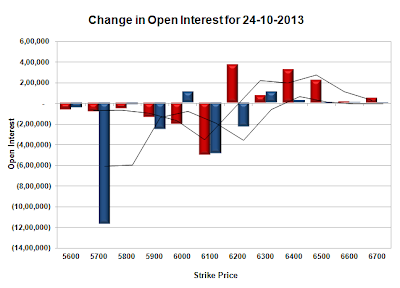 Initial and best Resistance at 6300, with OI of just 47.52 lacs, above that at 6400 with OI of 41.24 lacs. 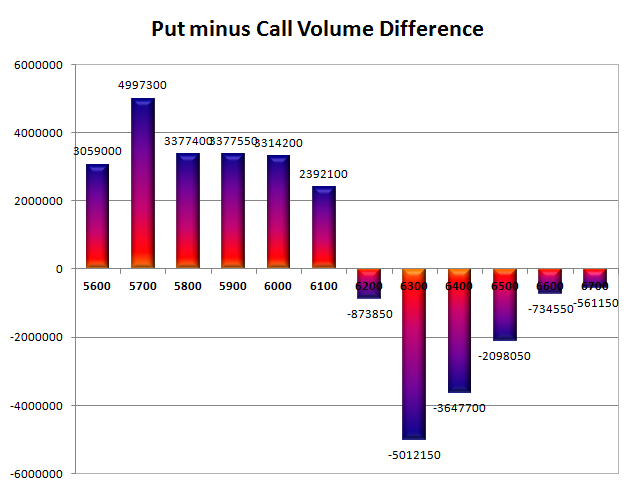 Day Range as per Option Table is 6091 - 6235 and as per VIX is 6124 - 6255 with 6154 as the Pivot. Nifty opened flat and stayed within a very narrow range for the better part of the morning session but saw the sellers take control in the second half to close the index at the lowest point of the day at 6045.85, a huge loss of 43.20 points. The broader market was also weak, with 643 advances to 704 declines. Support at 6000 and huge resistance at 6200 level. Call option 6200, 6400 added 9.20 lacs huge amount of OI with short covering seen at 6100 and below strike prices. Put option 6000-5500 added 19.51 lacs huge amount of OI with short covering seen at 6100 and above strike prices. Nifty Open Interest is at 1,92,32,100 up by 71,200, with decrease in price, most probably short build-up. Bank Nifty Open Interest is at 18,00,825 up by 36,700, with decrease in price, most probably short build-up. FII’s bought huge 2.53 lacs Futures, mostly long build-up, as their net OI increased by 18311 contracts (includes 61166 longs and 56111 shorts) and the average price per contract comes to around 5968.64. 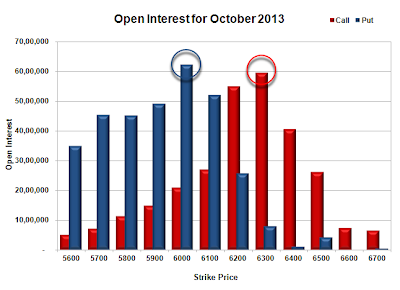 FII’s future open contract as on date is 504602. PCR Open Interest (Volume) has increased around the high point of the series at 1.398. 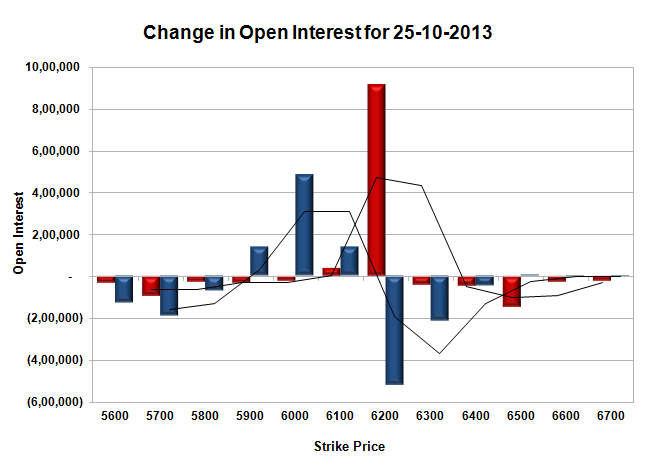 Initial support got better at 6000, with OI now above 58.15 lacs, below that at 5900, with huge OI of 48.28 lacs. 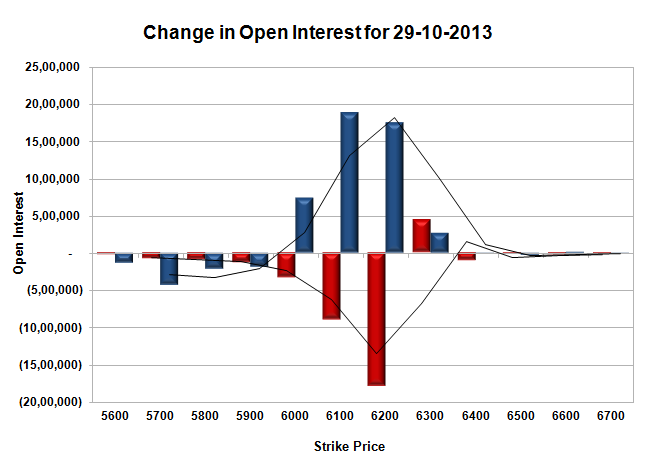 Initial Resistance at 6100, with OI of just 36.17 lacs, above that at 6200 with huge OI of 50.53 lacs. 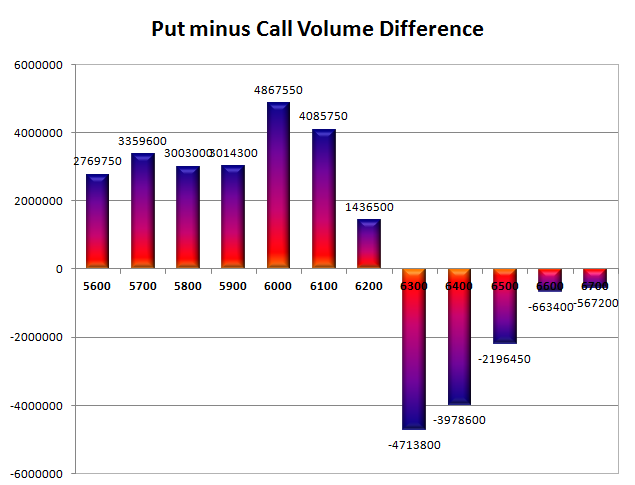 Day Range as per Option Table is 5992 - 6124 and as per VIX is 5979 - 6112 with 6063 as the Pivot.